kt literary » Blog Archive » Happy Book Birthday to Don Allmon! Happy Book Birthday to Don Allmon! Happy Book Birthday to Don Allmon whose BURNING MAGUS releases today! 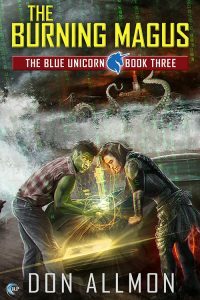 BURNING MAGUS is the last in Don’s Blue Unicorn trilogy – a cyberpunk fantasy trilogy filled with adventure, romance and fast cars! Whether you start at Book #1 or are one of the many fans eager for Book #3 – please help us give Don a huge round of congratulations! ← Happy Book Birthday to Tiffany Reisz!